When I darted my first lion in the 70's, things were very different. Dart guns were much less accurate than they are today. The darts were heavy metal and aluminium. (On one occasion the metal dart killed a cheetah outright on impact.) 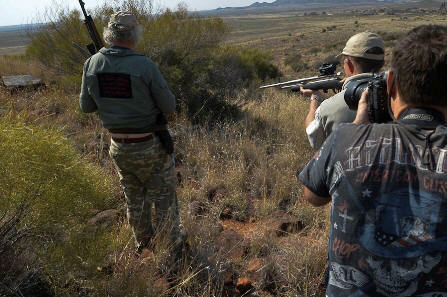 Today, a good vet can hit a small target at 40 metres with a modern dart gun. In the 70's there was no antidote for lions. I remember staying up many nights protecting sleeping lions that were recovering from being darted. With an antidote, a lion or tiger can be fully awake in 5 to 10 minutes. In those days we used a drug called Sernyl or Phencyclidine. (This drug was abused by the drug users in America and was called "Angel Dust". It caused hallucinations in humans). Occasionally a lion darted with Sernyl would go into a fit. We would put cardboard between its teeth to prevent it biting it's tongue. 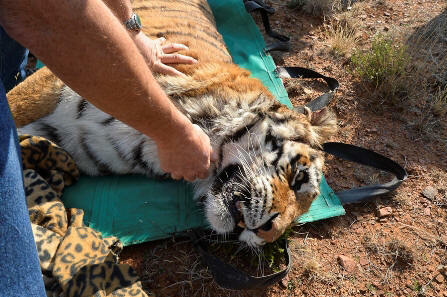 This last week at Tiger Canyons, Dr Ryan Nienaber and Dr Charlotte Mouiex expertly moved 5 tigers and put 3 tigresses on birth control. All of this in the space of a few hours. 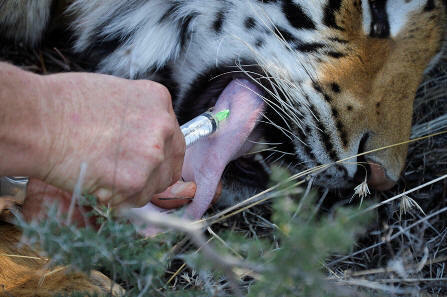 The introduction of contraception is hugely useful in a project like Tiger Canyons, where the numbers have to be carefully managed. 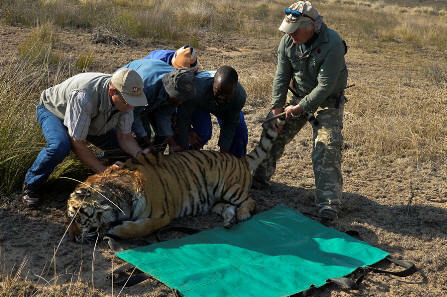 Once the tiger is darted, I am able to insert a microchip (this is for identification), place a satellite transmitter under the skin (this is a device which allows us to track the tiger and map it's home range), take a blood sample (this allows us for create a genetic profile of each tiger). 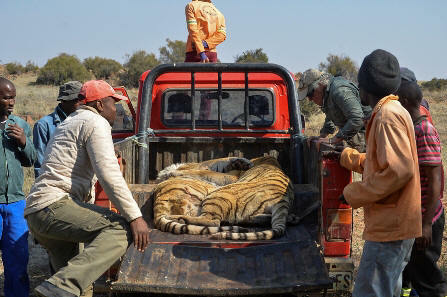 The mana‎gement plan to create one large area for tigers has begun and the first internal fence (5km long) is being removed as I write this. This means that Ussuri's 3 cubs, Antoine, Jameez, and Marguerite have a large area into which they can disperse. 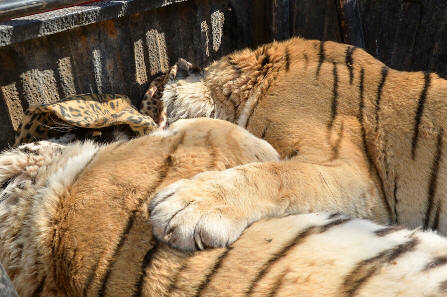 Ussuri and Tibo (the white tigress) are now able to greatly expand their territories. In theory Tibo's three cubs could be in danger from males that are not the father. However Shy Boy, Tiger Boy, and Seatao have all been moved to other areas. On moving Tiger Boy into Corbett's area, he immediately attacked Zaria's cubs. Zaria defended her cubs and a fight broke out. Corbett on hearing the fight, joined Zaria and attacked Tiger Boy. Tiger Boy got Corbett down and was winning the fight when Zaria jumped onto Tiger Boy and attacked him, saving Corbett's life. (I witnessed a similar incident in a fight between two male leopards, Marthly Male and Camp Pan Male. 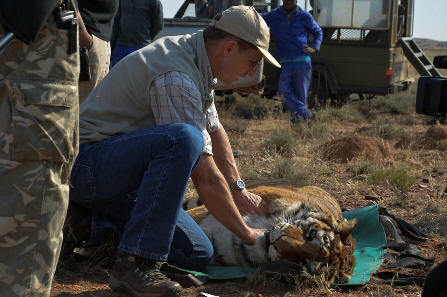 Vomba female jumped onto Marthly Male to help Camp Pan Male out who was the father of her cubs.) ‎After Zaria jumped onto Tiger Boy, all three tigers began boxing and I witnessed the incredible sight of 3 tigers, all a metre off the ground captured in one frame. While the adults were fighting, Zaria's cubs ran away but got separated. Tiger Boy killed one of the cubs the following morning. I would like to thank the following people who have over many years shared their knowledge of veterinary care and management of big cats with me. The late Dr Eddie Young and Dr David Meltzer. Doctors Roy Bengis, DeWald Keet, Peter Rodgers, Charlotte Mouiex and Ryan Nienaber. In addition Ian Whyte, Butch Smuts, Trevor Dealove. I would like to congratulate the African Network for Animal Welfare (ANAW) who had the courage to take the Tanzanian Government to court and prevent, for now, the highway through the Serengeti being built. Serengeti Watch supported a court case brought forward by the African Network for Animal Welfare (ANAW), a nonprofit organization located in Kenya, who filed for the case in December of 2010. We provided funding through its Serengeti Legal Defense Fund which paid for research trips to the Serengeti and legal fees for the Kenyan attorney, Saitabao Ole Kanchory. The suit was filed after the government of Tanzania announced plans to build a 53 Km commercial highway across the northern section of the Serengeti National Park. The highway would replace an existing dirt track. According to a Tanzanian government study the highway would carry up to 800 commercial vehicles a day by 2015, with increasing numbers thereafter. Scientists warned that the highway would bisect a narrow section of the Serengeti ecosystem that was critical to the annual wildebeest migration. Therefore, the proposed highway would cause the migration to collapse due the fragmentation of natural migration patterns. The lawsuit sought a permanent injunction against the proposed highway on the grounds that it was in violation of the East African Community Treaty, of which Tanzania and Kenya are signatories. The Treaty calls for “the promotion of sustainable utilization of the natural resources of the Partner States and the taking of measures that would effectively protect the natural environment of Partner States.” The applicant sought to bar Tanzania from “upgrading, tarmacking, paving, realigning, constructing, creating or commissioning” the existing track. Serengeti Watch and ANAW contended that opening a paved highway to the general public would cause irreversible damage to the Serengeti. The highway would impact: migratory species such as zebras and wildebeest; wildlife poaching; air quality and noise; soils; flora and fauna; road safety and increased accidents as well as many more unforeseen issues. ANAW cited conservation organizations that had issued warnings about the impact of the highway, including the UNESCO World Heritage Committee. The case also contended that the government of Tanzania was in violation of various international treaties. Chief among these, a UNESCO treaty declaring the Serengeti a “World Heritage Property” of “outstanding universal value. The court agreed with the plaintiff’s argument that the highway would have irreversible negative impacts. It affirmed that construction of the highway would be a violation of the East African Community Treaty. In doing so, the court order cited Tanzania’s own Environmental Impact Study and relied heavily on statements issued by the UNESCO World Heritage Committee. “A permanent injunction is hereby issued restraining the Respondent from going forward with its initial proposal of constructing or maintaining a road of bitumen standard across the Serengeti National Park subject to its right to undertake such other programs or initiate policies in the future which would not have a negative impact on the environment and ecosystem in the Serengeti National Park.” Read the court verdict. Although, the case sought to prevent any form upgrading, the court did not specifically bar this, only the development of an asphalt road. The government of Tanzania says it will instead upgrade the existing dirt track to an all-weather gravel road. The track is in a zone designated to wilderness area, reserved for park vehicles and walking safaris. The EACJ said that roads in the Serengeti should be “reserved for tourists and park personnel and not the general public,” its injunction did not specify this. Tanzania still has the ability to open roads for the public, including commercial use. In fact, in a recent press article, government officials have emphasized their intention to build a highway that would inevitably cross the park. The entire Serengeti ecosystem includes areas within the Serengeti National Park and outlying areas such as the Masai Mara. Wildlife migration takes place across all these regions. There are plans for paved roads in migration areas outside the park that will impact the migration. The court case did not address this issue either. I would like ‎to thank all of you who have kept exposing the despicable sale of 200 elephant calves to China. Keep the pressure up in the social media and keep asking the question, how is it that CITES have granted permits for these elephants. Hoole was also told that the Chinese are “rehearsing” loading elephants into their transportation crates with bull hooks. Training of wild-caught elephants involves beating, chaining, food deprivation, and social deprivation. “For elephants, being held captive for decades in a circus or in the majority of the world's zoos is gruesome, a fate worse than death," Joyce Poole, the cofounder of Kenya-based ElephantVoices, a research and advocacy organization, told National Geographic. In March, in an interview with National Geographic, Kasukuwere said that the Hwange calves would be relocated within Zimbabwe. But he also said that Zimbabwe authorities were looking for buyers and that if they received an “order,” they would export elephants accordingly. Ainsley Hay, with the National Council of SPCAs, in South Africa, says that “almost all training of wild-caught elephants involves breaking them using horrific abuse, including beating, chaining, stretching, food deprivation, and social deprivation. One possibility is that they’ll be trucked to the airport in nearby Victoria Falls, or perhaps the one in Zimbabwe’s second city, Bulawayo. Or they could be flown directly out of Hwange. Veterinarians and animal welfare groups in Zimbabwe say they’ve made numerous attempts to stop the export and have expressed their concerns to officials. Qingyuan is a prefecture-level city in Guangdong province, where Chimelong, billed as “the largest safari park housing the most species in the world,” is located.